It is perhaps some concession, that the only reason the death of Jimmy Ellis, the lead singer of The Trammps, was so widely covered, was the appearance of the track “Disco Inferno,” on the soundtrack of the 1977 film Saturday Night Live. Though the Trammps are often referred to as “one-hit wonders,” the wildly popular “Disco Inferno” came at the end of what had already been a distinct career in Dance music for the group. That the group is largely known only for that song—far from their best—speak volumes about the way Black musical genius was so often incubated, and thrived, beyond the gaze of mainstream culture. Though Ellis was born in Rock Hill, SC, growing up singing Gospel as so many of his peers did, it was in Philadelphia that he connected with Earl Young, Ronald Baker, and Norman Harris, who also worked as studio musicians at Sigma Sound and performed as members of the Philadelphia International Records (PIR) house band MFSB. In its earliest incarnation, the Trammps were known as the Volcanoes, and with their hit “Storm Warning” (1965) helped establish the “Philly Soul” sound, that was as indebted to street corner Doo-Wop singing as it was to the popular group The Coasters. By the time Ellis became lead singer of the group in the early 1970s, the trio of Young, Baker, and Harris—PIR’s Holland-Dozier-Holland—were looking for side projects to counter the exploitation they felt they were experiencing at PIR. 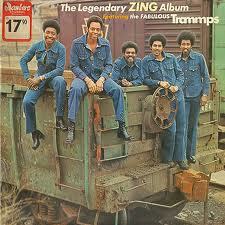 Young, Baker and Harris recorded several tracks with The Trammps in 1972, with Ellis as lead including, “Zing! Went the String of My Heart,”—a remake of the Judy Garland classic that had also been covered by The Coasters—“Pray All You Sinners,” and “Hold Back the Night.” The production trio also worked with First Choice, recording pop-Dance classics like “Armed and Extremely Dangerous” and “Smarty Pants.” The tracks represent the prototypical sounds of what would become known as Disco music in the mid-1970s—in his bookTurn the Beat Around: the Secret History of Disco, Peter Shapiro suggest that drummer Earl Young “pretty much invented the Disco beat.” Though Trammps’ tracks were hot in the clubs, the group’s label Buddah declined to release an album of their material, sensing that the group was limited commercially. In order to quell the coming rebellion of PIR musicians like Young, Baker and Harris, PIR allowed them to record as MFSB and also offered the Trammps a production deal and their own imprint “Golden Fleece.” Their first album for PIR in 1975, produced the hits “Love Epidemic” and “Where Do We Go From Here.” With their new found popularity, assisted by the strength of PIR’s promotion, Buddah released the early Trammps music on the Legendary Zing Album. With the release of those two albums, The Trammps’ role as architects of the Disco movement was already secure, a position that was only enhanced with the release of their Atlantic Records debut and the lead single “Where the Happy People Go,” which quickly became an anthem for the era and the group’s highest charting pop single at the time. “Disco Inferno” was initially released as the title track of the group’s second album for Atlantic in late 1976; it barely registered to pop audiences, not even breaking into the Pop-Top 40, though it was a top-Ten R&B hit. By the time The Trammps released Trammps III in November of 1977, “Disco Inferno” was in their rearview, and the group was trying to recapture the magic of their early records with a track like “The Night the Lights Went Out," inspired by the New York City Blackout of the summer of 1977, which Jeff Chang has suggested, might be the night that Hip-Hop finally went all-City. As a single, “The Night the Lights Went Out,” was dead in the water; The Trammps’ fortunes would change when the soundtrack for a little movie, starring a well-known Sweathog, was released in December of 1977. The soundtrack forSaturday Night Fever, sold over 15 million copies and topped the Billboardcharts for six-months, making the Bee-Gees households names, and giving the Trammps their last breathe of mainstream recognition; “Disco Inferno” peaked at #11 on the pop charts in 1978. For many Jimmy Ellis, is just an afterthought from a period that has been oft-derided and continuously commodified in movies and television shows; a period that is divorced from the Black, Latino, and Gay roots that made so-called Disco music such a powerful social and cultural force in the early 1970s. As Shapiro writes, The Trammps, “replaced the tension at the heart of Gamble and Huff’s signature sound with a whole-hearted embrace of the Disco.” Jimmy Ellis was the voice of that movement.